In the city of Gaya in India, a group of beggars, encouraged by officials from the State Society for Ultra Poor and Social Welfare, have set up an autonomous bank, which they run and manage themselves — enabling members to start saving, and providing them with a place to turn in times of financial crisis. The bank — known as Mangala Bank — is a small step towards upliftment for some of the most underprivileged members of society. 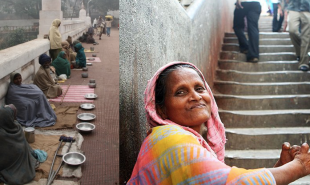 Since the beggars don’t have appropriate proof of identification, they would not be able to create an account at other banks, meaning they have no way of saving the alms they receive, begging at the gate of the nearby temple. The bank’s members deposit 20 Rupees — approximately USD 0.35 — every Tuesday, totalling 800 Rupees per week. The co-operative bank is run by Raj Kumar Manjhi, his wife Nagina Devi and other members. In cases of emergency — such as when Manjhi’s sister and daughter were burnt and needed medical treatment, the bank makes loans to its members which they must begin to pay back the following month, after which the bank charges 2 to 5 percent interest to encourage members to pay off their debts quickly. Are there other ways of enabling underprivileged people to access the financial infrastructure that could help them better themselves?